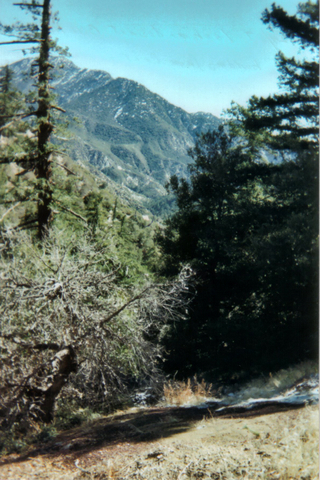 Although the mine building and mine are less than a quarter of a mile from the Angeles Crest Highway, and it's location shown on the Chilao Flat topo can be clearly seen just off the highway, the Bell Hartman Mine remains virtually unknown. The best approach is from the Cal Trans maintenance road near Newcomb's Ranch (permission required to enter). 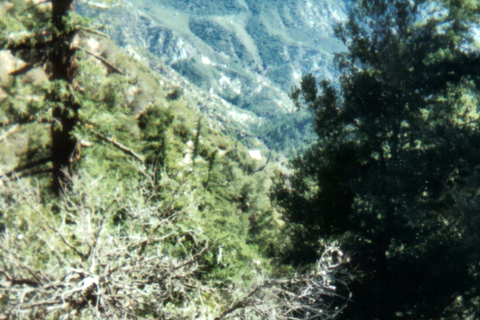 It is in a ravine 800 feet below the road and with no trail it takes almost an hour to reach. 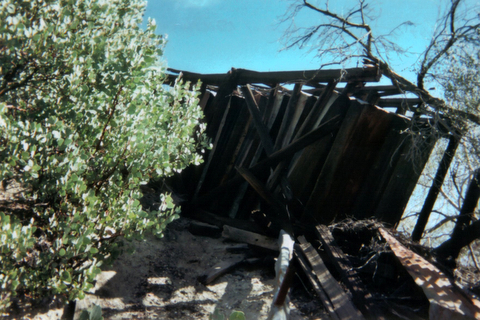 The Angeles Forest archaeologists are unaware of its existence. There is no mention of it online and only one brief mention in print. 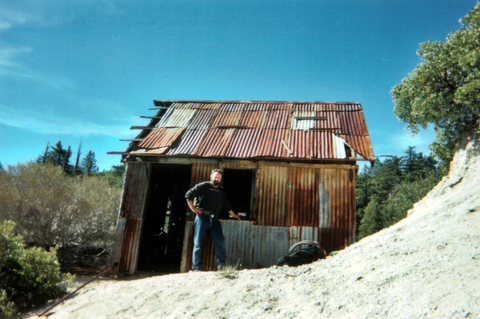 In John Robinson's Mines of the San Gabriels, published 34 years ago and long out of print, it is noted that two miners named Bell and Hartman did some small diggings around 1900 and later Charley Chantry (for whom the Chantry Flat is named) worked the area with little success. Recently, the writer made two trips to the building and mine first accompanied by website reader Kevin Copley who informed me of the mine and then with grotto member Daniel Veelik. 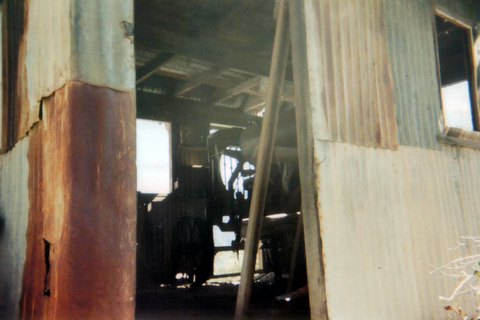 The small two story building is roofed and sided with corrugated tin shingles and is 14' X 12' in size. It's most interesting aspect is an 8 cylinder compressor on metal wheels. It is marked "Ingersoil-Rand Co" with the numbers '1942'. It contains an iron boiler with lettering stating it was tested on 11/03/23. The first floor also contains a work bench and cabnet with several gadgets and bolts. A ladder leads to an empty second floor. Adjacent to the building is a water tower which fell over two years ago (in 2005). 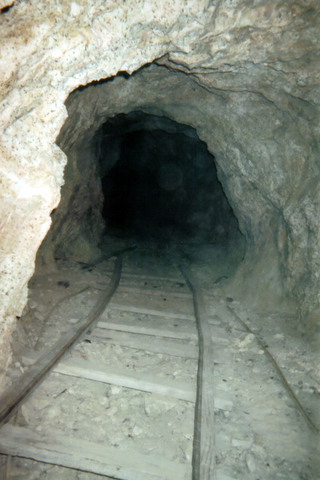 Down a slope 80 feet East of the mine is a small 60 foot adit with ore cart rails. 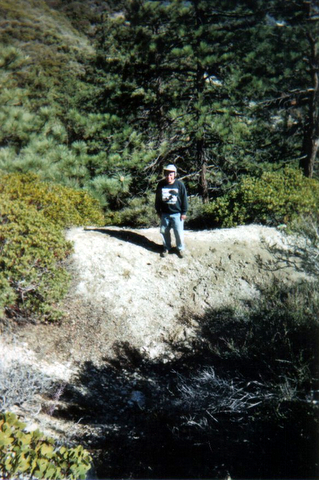 The Topo shows a shaft North of the mine, about 80 feet above the highway. A search of the area found the shaft was sealed off, perhaps in the 1940's or 50's. Presumably this was done by the forest service soon after construction of the Angeles Crest Highway reached that section in 1939. 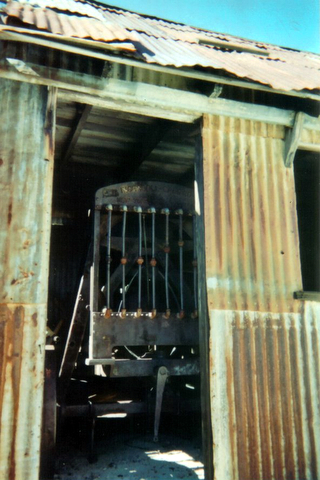 Prior to that time access to the mine would have been by wagon roads.